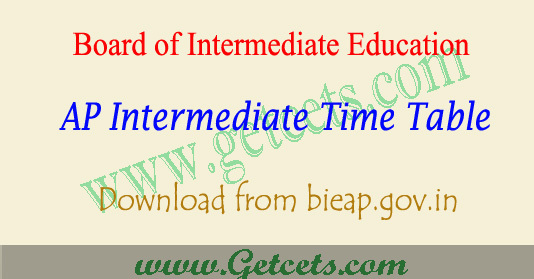 BIEAP time table 2019-2020, ap ipe 1st & 2nd year exam dates : Board of Intermediate Education of Andhra Pradesh has published ap intermediate exam timetable of 1st year and 2nd year it is available online. Candidates can download exam schedule pdf through bieap.gov.in website. ap intermediate 1st year exams starts from ** February 2019 and 2nd year exams will be conducted between 1st March 2019 and ** March 2019. May be ap inter hall tickets 2019 available in the month of last week of February and we update a next year ap intermediate time table 2020 in this website . BIE Andhra Pradesh has published the time table for intermediate examinations March 2019. The students appearing for the examinations can see the time table on the official website of the board which is: bieap.gov.in . The board conducts the intermediate 1st year & 2nd year examinations in the month of February/March. As per the schedule, the exams will conducted in the morning session. The examinations will commence from *** February and the will end on March **. Whereas, the practical exams in the general subjects will conducted for 20 days from 1st February to 21st February . Ethics and Human Values Examination is proposed to be conducted on 27-01-2019 (Saturday) from 10.00 AM to 1.00 PM. Environmental Education Examination is proposed to be conducted on 29-01-2019 (Monday) from 10.00 A.M to 1.00 P.M. Practical Examinations are proposed from 01-02-2019 to 21-02-2019 (including Sundays, except on 13-02-2019 (Maha Shivaratri) for General Intermediate courses in jumbling system. Frankly ask us by comments and share this BIEAP time table 2019-2020, ap ipe 1st & 2nd year exam dates article with friends on social media for appreciation for us and we may again continue for the AP Intermediate time table 2020 of 1st year and 2nd year exams and ap inter hall tickets 2019.